Enjoy the perfect flat and say hello to a new era in electroluminescence flat field science with the revolutionary Aurora light panel or as we affectionately call them - an “Aurora”. The new Aurora Flatfield Panel is an advancement in the well known technology of EF flat field foils. Taking into account the huge demand from all over the world, this new product line was especially designed to match the needs of astrophotography. The Aurora Flatfield Panel is a new light source technology for taking flat field images for use in calibration with digital images. It consists of a thin electroluminescent foil which emits an even, gentle white light after an external voltage is applied to it. For more technical explanation on electroluminescence, please refer to the Wikipedia page about Electroluminescence. Lightweight and easy to handle inverter for 12V and 110/240V available - suited to both stationary and mobile use. The Aurora Flatfield Panels are mounted in a rigid frame consisting of virtually unbreakable plastic with an extra protection around the edge so your Aurora is very well protected during transport and travel. The opaque front plate gives you a more uniform brightness than the EL material alone. For very fast optical systems, you will likely need to reduce the brightness by placing some sheets of paper in front of the EL sheet and the frame of the Aurora will keep them secure..
To get high quality flatfield date you have to select the right size of Aurora! 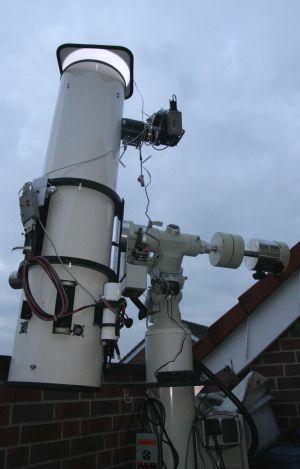 The clear diameter of your instrument has to be fully covered. The diameter of the dewcap is not important! If you use a nwton, Cassegrain, RC, ODK or something like this, the Aurora has to be LARGER than the clear diameter of the optic. As a rule of thumb, the Aurora has to cover the clear diameter of the mirror + the diagonal ogf the sensor used inside your camera. An example : If you use a 8" (204mm) newtonian telescope, the 220 Aurora is sufficient if you have a camera with a quite small sensor (<14mm diagonal). If you use a typical DSLR with an ASP-C sized sensor you will have to select an Aurora one size larger. The light emanating from the Aurora Flatfield Panels is slightly blueish-white. Most panels from other suppliers seem to provide pure white light (as perceived by the human eye) but the light is in fact made of discrete emission lines. Due to this, the flat field EL panels from most other suppliers are not suitable for narrowband emission line filters. We have tested the products of all EL sheet manufacturers worldwide and selected these particular EL foils for our Aurora Flatfield Panels because they are the best for astronomical applications. The spectrum of the Aurora Flatfield Panels is not made of some emission lines. Intstead, the EL material used in the Aurora Flatfield Panel has a very broad, continuous emission across the whole spectrum. This fact is what makes our Aurora Flatfield Panels great for narrowband emission line filters. The three spectra below illustrate the difference between our continuous spectrum EL panels and typical EL panels with light generated with discrete emission lines present. You can see the very broad emission of the new Aurora Flatfield Panel which is very well suited for the work with DSLR and cooled CCD cameras, working with broadband or RGB filter and for work with narrow band emission line filters as well.. The brightness of the Aurora Flatfield Panel is matched to work best with typical light intensity levels produced after passing through filters. If you are working with light from the whole spectrum, such as when using no filter or only a UV+IR blocked Luminance filter, you will likely have to the reduce the brightness of the panel. The brightness can be controlled electronically to some extent by reducing the input voltage of the inverter (12V inverter only). If the panel is still too bright for your setup, as may be the case with fast instruments and/or very light sensitive cameras, you should consider putting one or more sheets of paper into the frame between the layer of white plexiglass and the EL material. For very fast optical systems and/or large cameras with slow shutters, the brightness of the Aurora has to be reduced effectively. 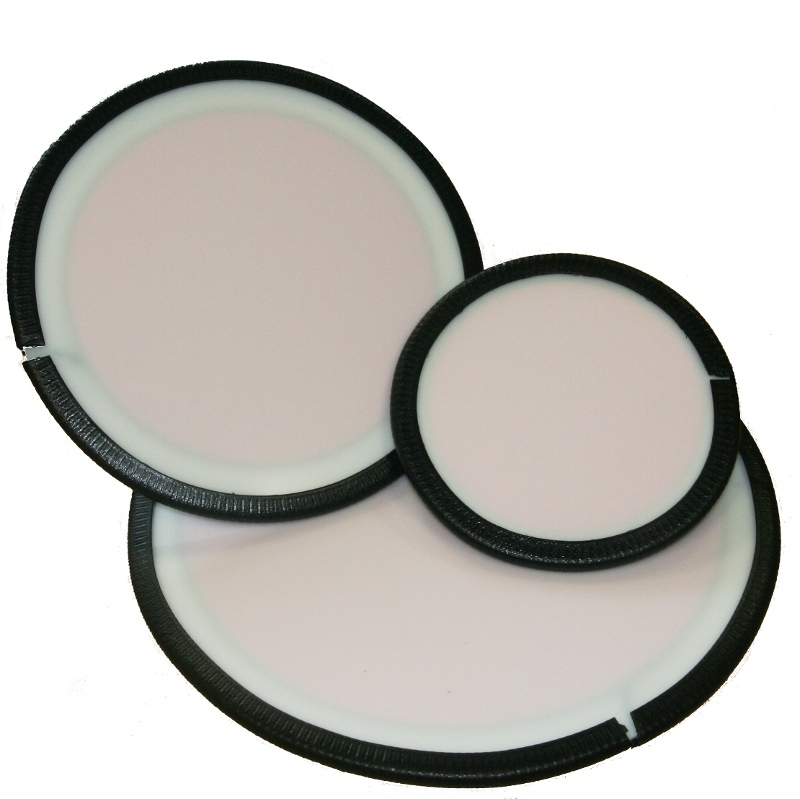 To that end, we offer neutral density / grey filters foils in corresponding sizes to be placed inside the frame of the Aurora panels. For customers with fast Astrographs and/or very sensitive cameras we do recommend getting one or two of the foils. 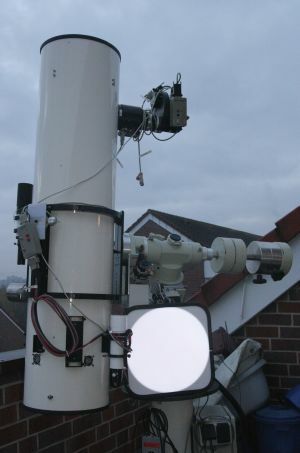 The brightness is very even across the whole surface and it works well for the most critical imaging applications, even photometry or spectroscopy (see application links above). The Aurora Flatfield Panels packages include a compatible inverter. (Standard AC adaptors won't work.) The panel is illuminated by the external high voltage produced by the inverter. This high voltage, however, is produced at very low amperage, so there is no risk of electric shock. IMPORTANT: Please use the Aurora Flatfield Panels with the supplied matching inverter only. Connecting a panel to an inverter of the wrong size reduces the lifetime of the unit. There are 12V inverters for all sizes of Aurora Flatfield Panels and for the large size units there are also 110/230V inverters available. Your Aurora Flatfield Panel is shipped as a ready-to-use set consisting of the mounted EL substrate, the matching inverter, all cables and a printed manual.